Are you a cone or cup person? I was usually a cup type of girl myself (save a few calories? why not!) But why eat them at all when you can use them as a vase and pass on feeling the guilt. Now, that’s my type of treat. 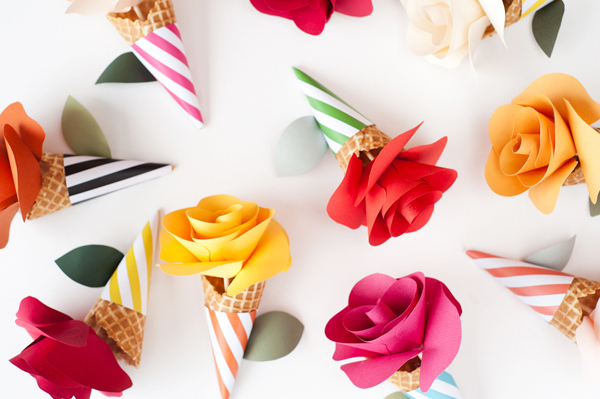 These paper flower ice cream cone bouquets would be perfect for birthday parties, a good cheer up, or just the floral/ice cream lover like myself. Click through for all the instructions! Step 1: Using Jordan’s party hat template, scale down the size to fit your cone and draw it diagonally on the striped paper. Step 2: Cut around the template. Step 3: Wrap it around the cone and secure it with double-sided tape. 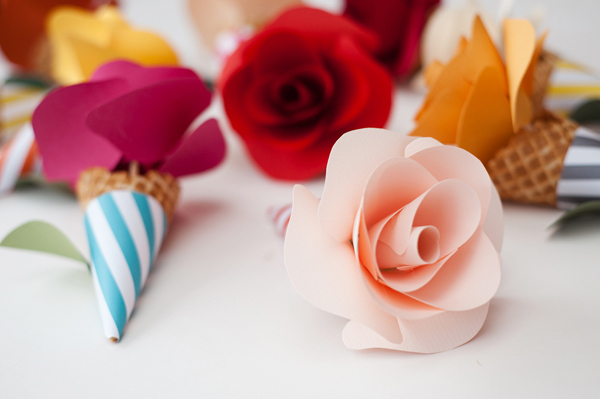 Step 4: For the flowers, I created a rose from my tutorial here. 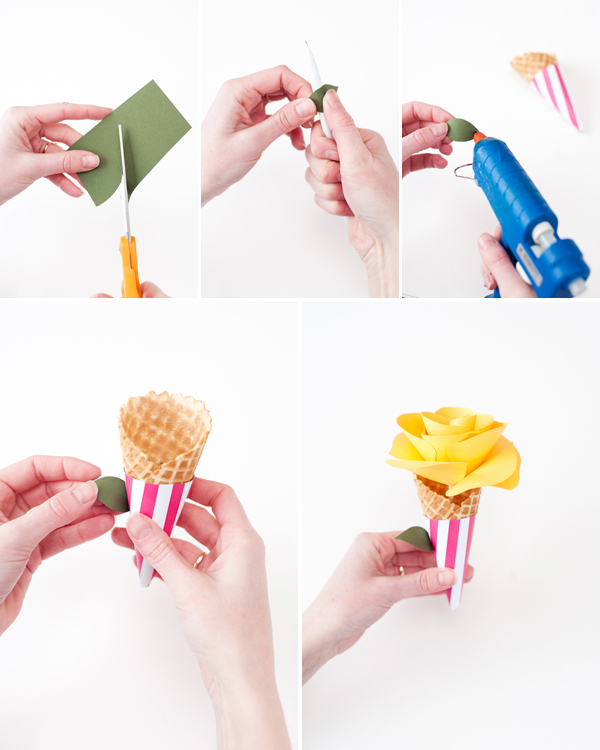 Step 5: Glue gun the skewer to the inside of the flower and hold in place until dry. Step 6: Cut out leaves from the green paper. Step 7: Roll them around a pencil to create shape. Step 8: Dab some glue onto the tip of the leaf and attach to the cone paper. Step 1: Insert the skewer into the bottom hole of the stand. Step 2: Turn it over and insert the skewer into the bottom of the cone. ahh these are so pretty! i don’t know why but i think they’d be gorgeous on a candy bar or something, at a wedding or other colourful event! Oh i love those. This post makes me happy!! Thank you! Wow….they are so pretty…Can make anyone’s day….btu paper things don’t last for long here in India, considering the dust which keeps coming in!! sooo cute! These are great because you can make them ahead of time and not worry about doing flowers the morning of your event! LOVE THESE! So so cute, thanks for sharing … can’t wait to try them out! How sweet! 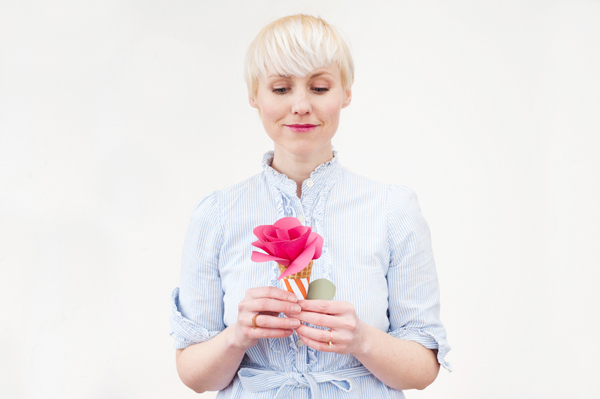 I can totally see sweet little girls running around with their tiny bouquets. Well done! They are so pretty! 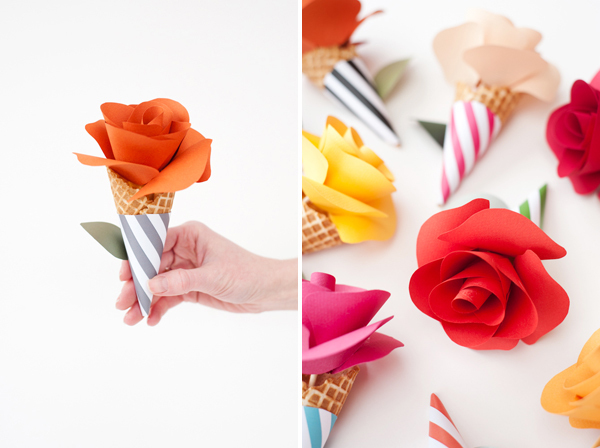 Been looking for a paper rose tutorial so this is perfect! Thank you! So cute! 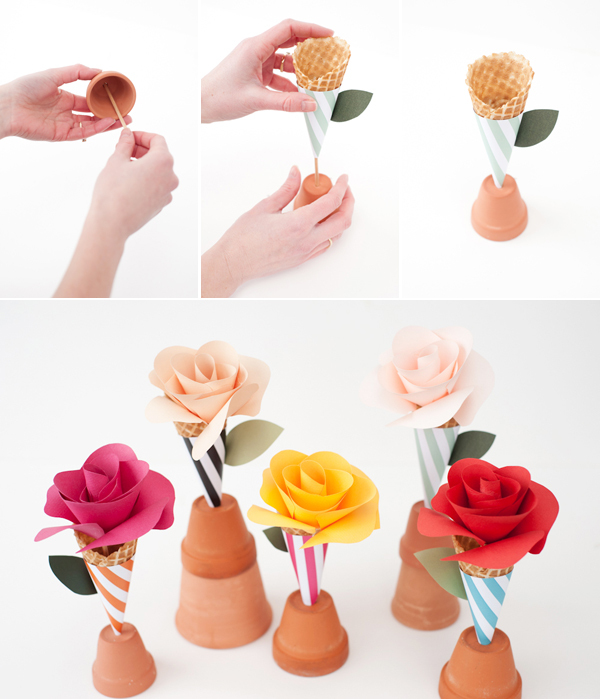 How about edible flowers in the cone? Yum! This post was just what I need to see on a cold, rainy, blustery day! Delightful! So cute. I just love everything you think of! 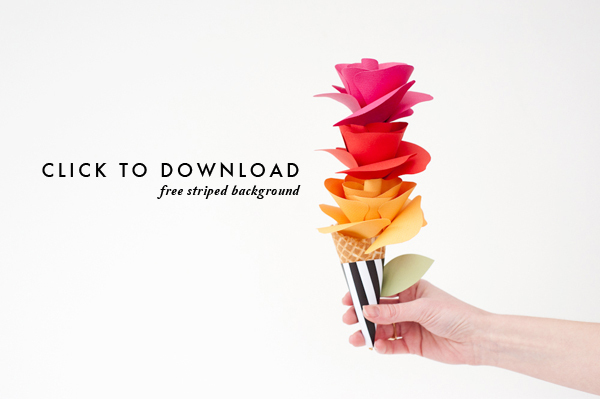 Flower cone bouquets! 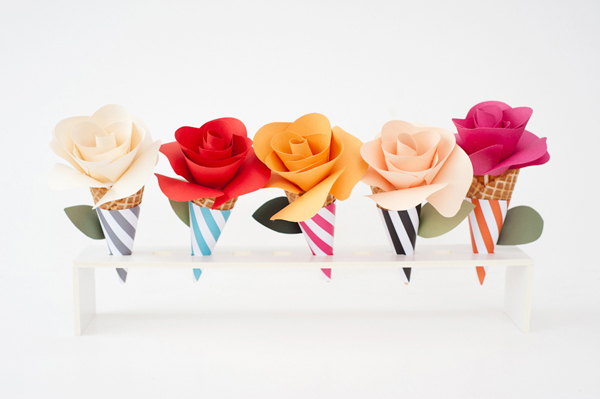 What a wonderful idea I love the bright colors and how real the rose petals look. I’ve been following your blog for a while now and am so grateful for all the creativity you share! My daughter would fall in love with this. Can’t wait to try it. Thanks! 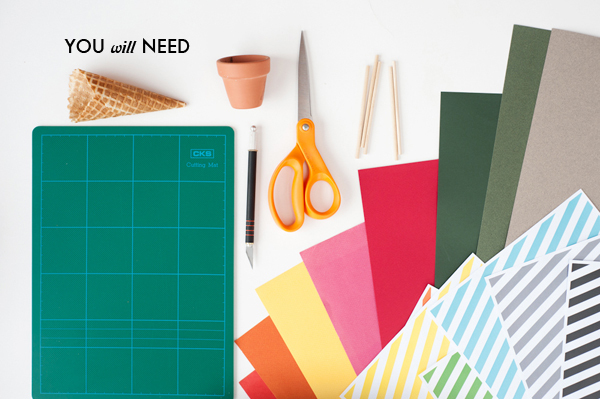 I love a craft that you can do with stuff you already have around the house – this looks like fun. I’m so gonna make this! I am literally in LOVE with this idea. And all of your ideas for that matter. This is so clever and brilliant and beautiful! Now someone please give me a worthy occasion to make these! OMG, I’m new to your site and I can’t stop reading. I’m loving everything here. I’m not a crafty girl (never had the talent) but seeing this just changed my mind! those are so cheerful. i can’t help but think of cecil beaton’s costumes for the ascot scene from my fair lady. Absolutely gorgeous and so beautifully done. What an awesome idea!!! Brittany, this is just gorgeous! I love the colors and the stripes. It is just beautiful work all around. What a great idea to use for mother’s day, too! a-dor-a-ble! Love the colors. 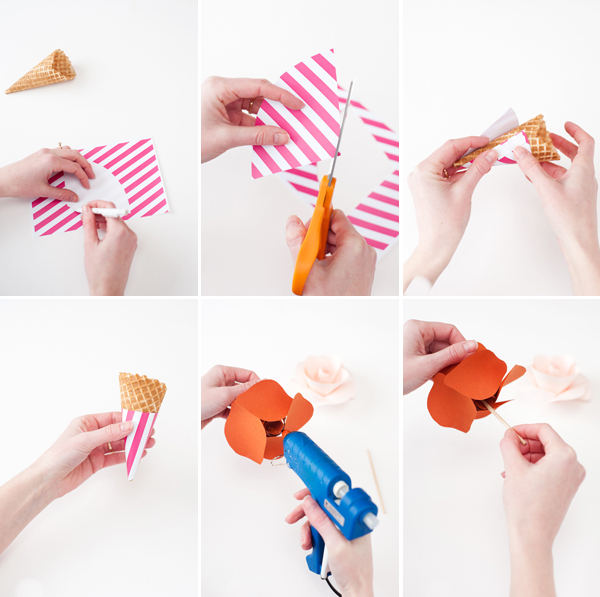 There are so many useful elements to this tutorial, and I love the simplicity of the striped paper, but how it really pulls the whole project together. Great job! Awesome! I am thinking party… Thanks for sharing! These are so adorable. What a fun idea. omg. these are beyond adorable!! i’m planning a baby shower for my sister (june shower) and these would be perfect! These are really cool, Brittany. Love the short blonde hair! I love these cones! sooo cute! I can’t get the link to work for the free printable though, it doesn’t even lightup when you scroll over it like your others do. What do I need to do? Thanks!! I love this but I can’t get the download link to work??? What am I doing wrong? Hello, you have a beautiful tutorial! contas de sorrir. « verde-ervilha.